BERLIN - The Town Council unanimously rejected the proposed $43.9 million education budget and $45.6 million general government budget Wednesday, forcing a meeting with the Board of Finance on Monday before the budgets can be sent to referendum. 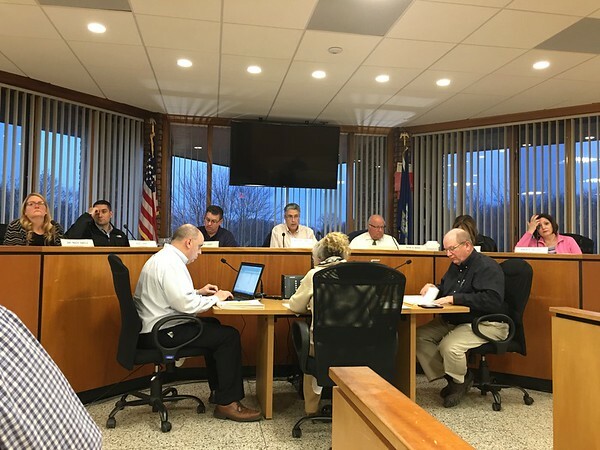 The vote came at a special meeting that followed discussion during a recess by members of the council and finance board of alternatives to the funding of about $2 million in capital projects. Before the recess, Mayor Mark Kaczynski suggested using short-term bonding to complete the needed projects and lessen the tax burden on residents. Wednesday’s vote was held after the council had voted Tuesday 3-3 along party lines - Democrats for, Republicans against - on sending the bill to referendum. Mayor Mark Kaczynski, whose vote would have broken the tie, was absent. On Wednesday, he explained that he had a commitment to long-scheduled work-related event that he couldn’t break. The recess session, during which members of the council and finance board caucused separately, changed the capital project list. The list includes replacement plow trucks, police cruisers and infrastructure improvement the finance board said had been put off for years. The remaining capital projects on the list would still be funded. The final budgets would also reduce the planned $1.5 million in bonding for road paving by $500,000. “I’m sorry, but we can’t pay for everything. We just can’t do it. It’s impossible without a huge tax increase,” said Kaczynski. Finance Director Kevin Delaney advised that it would not be prudent to use bonding for the projects, as that would increase the debt service payments by about $60,000 in interest next year and about $400,000 in principal and interest in each of the following three years to cover the additional new borrowing. The proposed changes would result in a new tax rate increase of 1.17 mills from the current 31.61, an increase of 3.7 percent, said Leonard Zielinski, budget analyst for the town. That would mean a $204 increase in property taxes on a house valued at $250,000. The budget presented to the council called for a 5.2 percent, or $292, increase in taxes on that same house. Despite realizing the increase reduction isn’t as much as it may have desired, the council still decided to have the finance board compose a list of capital projects to be funded with the $1.1 million in bonding in preparation of the joint meeting on Monday. The meeting is scheduled for 7 p.m. at the Berlin-Peck Memorial Library, 234 Kensington Road. Acting Town Manager Jack Healy said he was uncomfortable with the legality of having the finance board doing that without an official meeting - it has none scheduled before Monday - and said he would check with corporation counsel to see if it is permissible. “It’s something different. We’ll give it a shot and see where it goes,” said Kaczynski. Finance board Chairman Sam Lomaglio said he is happy with the move if the council is. After the meeting, a resident who said she’s lived in the town for 20 years, told The Herald she opposed the initial 5 percent increase in taxes because it came on top of growth in the Grand List during a revaluation year. “It’s really not fair” said the woman, who asked anonymity because her husband does business with the town. Republican councilors initially wanted to reduce the capital list, starting with the snow plows and police cruisers. But Jim Simons, who oversees the town’s fleet of vehicles, said old equipment couldn’t be used any longer without posing a risk of breaking down. The Republicans said the school budget was fine and there was nothing to do on the town side. Democrat members had opened the meeting by indicating that they favored sending the budgets to referendum. During public comment at the start of the meeting, Lomaglio asked how the Republican majority of the council could cut the budgets without having been a part of the process until now. Resident Janice Zagorski, who also had spoken at Tuesday’s meeting, echoed her comments commending the work of the finance board in building the budgets. Copies of the budgets and explanations of them can be found on the finance department page of the town’s website, town.berlin.ct.us. Posted in New Britain Herald, Berlin on Thursday, 5 April 2018 20:39. Updated: Thursday, 5 April 2018 20:41.